Elegant accommodations and the gracious hospitality of the Gordineer Family await discriminating travellers just west of Williamsburg in the scenic James River Plantation Country. 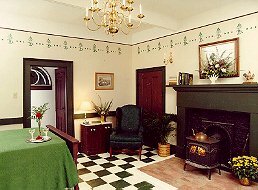 Piney Grove is a National Register landmark and Virginia Historic landmark that provides inspected, rated and approved accommodations. Spacious, tastefully appointed guestrooms are heated and air-conditioned, include private baths and are furnished with family heirlooms. Depending on the season, guests will sip Hot Toddies or Mint Juleps upon arrival. Dinner may be enjoyed at one of three fine restaurants nearby. 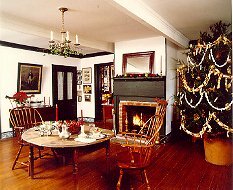 Bed and Breakfast guests return to enjoy the warmth of a wood-burning fire during the winter or porch breezes and starlit sky during the summer. Turn-down service and brandy nightcaps are also provided. And each morning guests awake to a served candlelit plantation breakfast in the 1790 Log Room. Guests may also select a bottle of Virgina wine or cider. 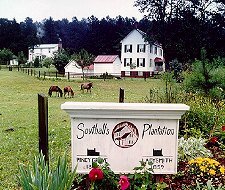 The grounds include four historic houses (Piney Grove-1790, Ashland-1835, Dower Quarter-1835, Ladysmith-1857), a church, gardens, outbuildings, a swimming pool, nature trail and a barnyard of farm animals. Croquet, badminton, birdwatching, and reading are just some of the relaxing activitites to enjoy at Piney Grove. Rates: Please call rates. Lodging / Dining / Touring Packages Available.